You are currently browsing articles tagged @Ookla. At the uptown end of the 59th Street/Columbus Circle subway platform there hangs from the ceiling a box with three disks on fat stalks, connected by thick black cables that run to something unseen in the downtown direction. Knowing a few things about radio and how it works, I saw that and thought, Hmm… That has to be a cell. I wonder whose? So I looked at my phone and saw my T-Mobile connection had five dots (that’s iPhone for bars), and said LTE as well. 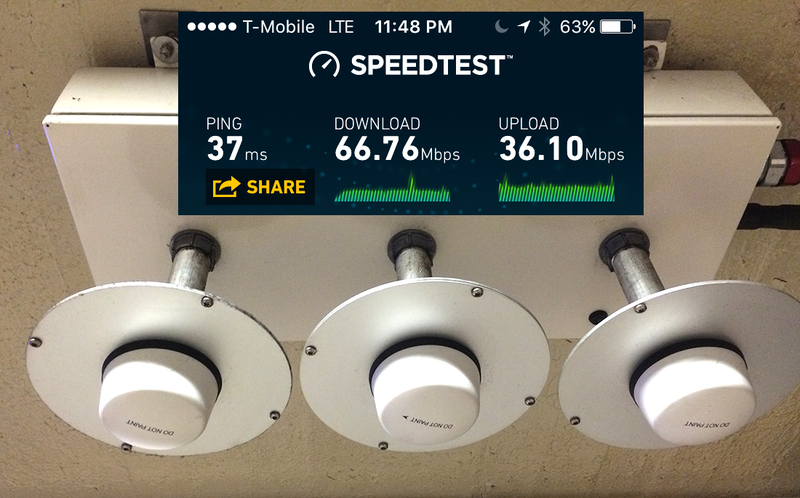 So I ran @Ookla‘s Speedtest app and got the results above. Sure, you’re not going to binge-watch anything there, or upload piles of pictures to some cloud, but you can at tug on your e-tether to everywhere for a few minutes. Nice to have. So I’m wondering, @TMobile… Are those speeds the max one should expect from LTE when your local cell is almost as close as your hat? Meanwhile, thanks for taking care of my Main Stop in midtown.